Heavy rain reached northeast Colorado early this afternoon, and has really grown in intensity over the last hour. It is expected to continue off and on through Wednesday. A Flash Flood Watch is in effect for nearly all of Colorado through Wednesday PM, including the city and county of Denver. The overall synopsis has not changed since our post yesterday. Heavy rain with slow moving storms will mean an increased threat for flooding over the next 24 to 36 hours. Rainfall totals for northeast and northcentral Colorado are expected to be anywhere from 0.5 to 3 inches by Wednesday night, with locally heavier amounts possible. We have already seen several Flash Flood Warnings posted north and northwest of Fort Collins, and expect more to come over the next day or so. Please be weather aware, and heed any warnings that are issued for your area. It’s proving very difficult to pinpoint exactly how much rain any single location will receive. Models have been fluctuating greatly run-to-run both with regard to timing and locations of heaviest precipitation. What is certain is that the ingredients are in place for a widespread heavy rainfall event, but expect great variation in totals when it’s all said and done. The 12z model suite has largely continued to insist much of the heaviest precipitation from this event may occur Wednesday, especially for southern Colorado. If you happen to see less rainfall this afternoon and into this evening, you’re not out of the woods yet as the rainfall threat continues tomorrow. 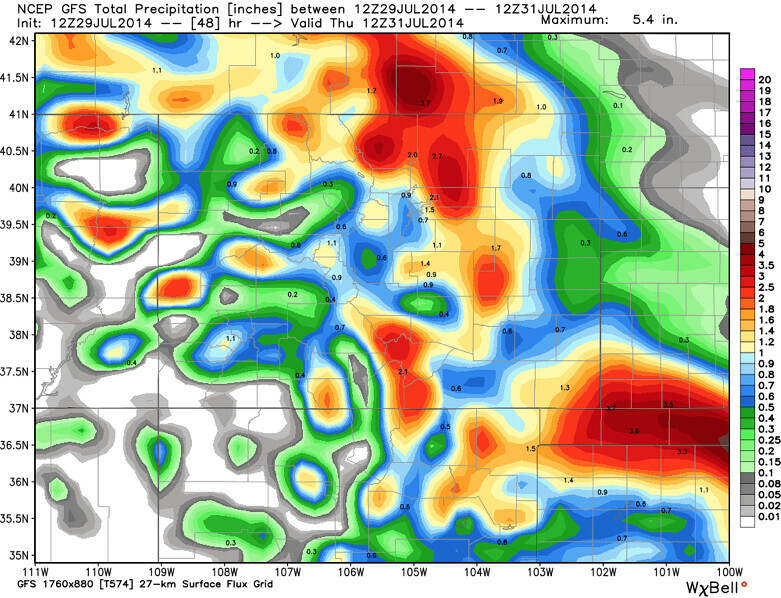 Here are the 12z GFS precipitation totals through Thursday morning for Colorado, the EURO looks similar. The NAM continues to “dry-slot” much of Denver proper and the southwest suburbs, shunting the bulk of the precipitation north and east of Denver. We’ll see how it handles things, as both the GFS and EURO are a bit more impressive in the city, as well as the higher terrain to the west. As we typically do, we’ll be weighing the NAM a bit lower, especially its 18z run. (We’ve already seen more than it’s 18z run in central Denver with cell currently overhead!). Really any way you cut it, someone’s getting a lot of rain over the next 24 to 36 hours. We’ll watch carefully and update as needed. Warnings will be posted on our Twitter feed as well.